There are few things I did in high school more embarrassing than trying to be a rapper. Today that doesn't sound so terrible, however, in a farm town during the 1980's things were a little different. One tends to stick out standing next to the 4-H kids while wearing a bandanna, a hat cocked to the side, and a chunky gold necklace heisted from their mother's jewelry box. Yeah, that was me, and I was anything but "fly." My look, though, was not the real problem--that would've been my mullet and a serious lack of rhyming skills. In short, who I was trying to be and who I really was failed to align, and as a result, my classmates didn't understand me let alone take me seriously. Many companies are like this when it comes to aligning their content marketing strategy with their brand messaging. The two don't jive, and they end up being misunderstood in what they are saying. This however, can be avoided by taking into account several consideration which I cover as a guest at Nimble. 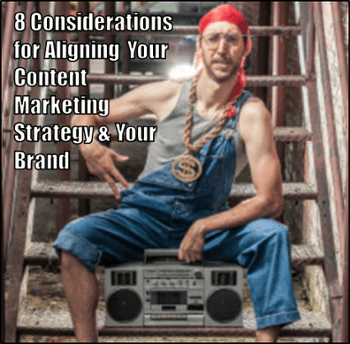 The Country Boy Rapper: 8 Considerations for Aligning Content Marketing Strategy with Your Brand.